If you want to keep things simple by only having a few files to deploy, i.e. a stand-alone executable with the associated compiler specific DLLs, then you must build everything statically. This will build Qt statically. Note that unlike with a dynamic build, building Qt statically will result in libraries without version numbers; e.g. QtCore4.lib will be QtCore.lib. Also, we have used nmake in all the examples, but if you use MinGW you must use mingw32-make instead. You probably want to link against the release libraries, and you can specify this when invoking qmake. Now, provided that everything compiled and linked without any errors, we should have a plugandpaint.exe file that is ready for deployment. One easy way to check that the application really can be run stand-alone is to copy it to a machine that doesn't have Qt or any Qt applications installed, and run it on that machine. Remember that if your application depends on compiler specific libraries, these must still be redistributed along with your application. You can check which libraries your application is linking against by using the depends tool. For more information, see the Application Dependencies section. The Plug & Paint example consists of several components: The application itself (Plug & Paint), and the Basic Tools and Extra Filters plugins. Since we cannot deploy plugins using the static linking approach, the application we have prepared is incomplete. It will run, but the functionality will be disabled due to the missing plugins. To deploy plugin-based applications we should use the shared library approach. We assume that you already have installed Qt as a shared library, which is the default when installing Qt, in the C:\path\to\Qt directory. For more information on how to build Qt, see the Installation documentation. If everything compiled and linked without any errors, we will get a plugandpaint.exe executable and the pnp_basictools.dll and pnp_extrafilters.dll plugin files. To deploy the application, we must make sure that we copy the relevant Qt DLL (corresponding to the Qt modules used in the application) as well as the executable to the same directory in the release subdirectory. Remember that if your application depends on compiler specific libraries, these must be redistributed along with your application. You can check which libraries your application is linking against by using the depends tool. For more information, see the Application Dependencies section. We'll cover the plugins shortly, but first we'll check that the application will work in a deployed environment: Either copy the executable and the Qt DLLs to a machine that doesn't have Qt or any Qt applications installed, or if you want to test on the build machine, ensure that the machine doesn't have Qt in its environment. If the application starts without any problems, then we have successfully made a dynamically linked version of the Plug & Paint application. But the application's functionality will still be missing since we have not yet deployed the associated plugins. Plugins work differently to normal DLLs, so we can't just copy them into the same directory as our application's executable as we did with the Qt DLLs. When looking for plugins, the application searches in a plugins subdirectory inside the directory of the application executable. To verify that the application now can be successfully deployed, you can extract this archive on a machine without Qt and without any compiler installed, and try to run it. One benefit of using plugins is that they can easily be made available to a whole family of applications. It's often most convenient to add the path in the application's main() function, right after the QApplication object is created. Once the path is added, the application will search it for plugins, in addition to looking in the plugins subdirectory in the application's own directory. Any number of additional paths can be added. When deploying an application compiled with Visual Studio 2005 onwards, there are some additional steps to be taken. First, we need to copy the manifest file created when linking the application. This manifest file contains information about the application's dependencies on side-by-side assemblies, such as the runtime libraries. The manifest file needs to be copied into the same folder as the application executable. You do not need to copy the manifest files for shared libraries (DLLs), since they are not used. to your .pro file. The embed_manifest_dll option is enabled by default. You can find more information about manifest files and side-by-side assemblies at the MSDN website. There are two ways to include the run time libraries: by bundling them directly with your application or by installing them on the end-user's system. Warning: If you skip the step above, the plugins will not load on some systems. To install the runtime libraries on the end-user's system, you need to include the appropriate Visual C++ Redistributable Package (VCRedist) executable with your application and ensure that it is executed when the user installs your application. For example, on an 32-bit x86-based system, you would include the vcredist_x86.exe executable. The vcredist_IA64.exe and vcredist_x64.exe executables provide the appropriate libraries for the IA64 and 64-bit x86 architectures, respectively. Note: The application you ship must be compiled with exactly the same compiler version against the same C runtime version. This prevents deploying errors caused by different versions of the C runtime libraries. As well as the above details for VS 2005 and onwards, Visual Studio 2008 applications may have problems when deploying manually, say to a USB stick. The recommended procedure is to configure Qt with the -plugin-manifests option using the 'configure' tool. Then follow the guidelines for manually deploying private assemblies. create a folder structure on the development computer that will match the target USB stick directory structure, for example '\app' and for your dlls, '\app\lib'. on the development computer, from the appropriate 'redist' folder copy over Microsoft.VC80.CRT and Microsoft.VC80.MFC to the directories '\app' and '\app\lib' on the development PC. xcopy the \app folder to the target USB stick. Your application should now run. Also be aware that even with a service pack installed the Windows DLLs that are linked to will be the defaults. 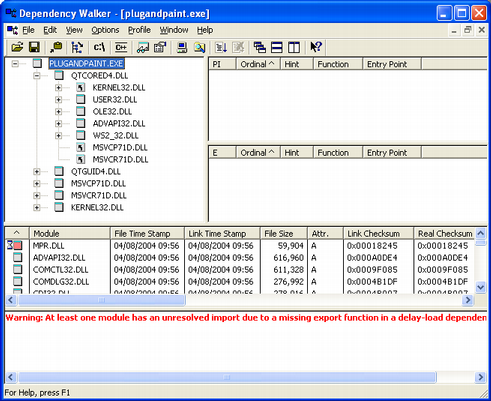 See the information on how to select the appropriate target DLLs. This will provide a list of the libraries that your application depends on and other information. When looking at the plugin DLLs the exact same dependencies are listed. Using qt.conf. This approach is the recommended if you have executables in different places sharing the same plugins. Using QApplication::addLibraryPath() or QApplication::setLibraryPaths(). This approach is recommended if you only have one executable that will use the plugin. The executable will look for the plugins in these directories and the same order as the QStringList returned by qApp->libraryPaths(). The newly added path is prepended to the qApp->libraryPaths() which means that it will be searched through first. However, if you use qApp->setLibraryPaths(), you will be able to determend which paths and in which order they will be searched. Cross compiling Qt/Win Apps on Linux covers the process of cross-compiling Windows applications on Linux. Cross-compiling Qt4/Win on Linux provides another Linux-to-Windows cross-compilation guide.